FORT WORTH, Texas (June 21, 2018) – There’s nothing quite like a side-by-side race between two powerful vehicles. Engines revving and roaring before the starter’s arm drops and the drag race is on. It’s incredible. It’s intense. On Friday evening, Texas Motor Speedway will open its 10thanniversary season of a program that continues to provide a safe, structured and, most importantly, legal alternative for what has been a dangerously persistent problem in the Dallas-Fort Worth Metroplex. Established in 2009 to help local authorities curb illegal street racing, the Universal Technical Institute Friday Night Drags provides six consecutive weeks of head-to-head competition on a 1/8-mile drag strip situated on the speedway’s pit lane that accommodates everyone from the serious drag racer to the novice. Pollozani noted that the Fort Worth Police Department is routinely responding to calls for illegal street racing and events. He noted that two years ago a total of 75 citations were given out in one night for everything from illegally parked vehicles, speeding and various traffic offenses – all of which were connected to a street-racing activity. In early April, a truck crashed into a home in the Dallas suburb of Oak Cliff in a street-racing incident. Someone was home at the time and fortunately was able to escape unscathed, but the house was essentially destroyed from the collision. Later that same month, the Dallas Police Department responded to the scene of a street-racing incident that resulted in a fatality and five others – three adults and two children – being transported to hospitals with injuries. Recent studies indicate that street-related accidents account for an average of 135 deaths annually in the United States. The Universal Technical Institute Friday Night Drags opens this week and runs through July 27. Prizes will be awarded to the top racer in seven different divisions each week with an overall champion crowned in each division on July 27. Each week also features the Hills Air Support Show-N-Shine. Car enthusiasts that like to show off their cherished rides can do so and earn weekly awards in four different categories. The cost is $20 to participate in the Universal Technical Institute Friday Night Drags or Hills Air Support Show-N-Shine competition each week. For those who would like to watch the action, general admission grandstand tickets are $10 for adults and $5 for children 12 and under. Tickets are available for advance purchase at www.texasmotorspeedway.com or at the Gate 6 ticket booth. Parking is free in the PSL lot outside of Gate 6 and available for $20 in the infield (with admission included in the pricing). Coolers are permitted in both the grandstands and infield. 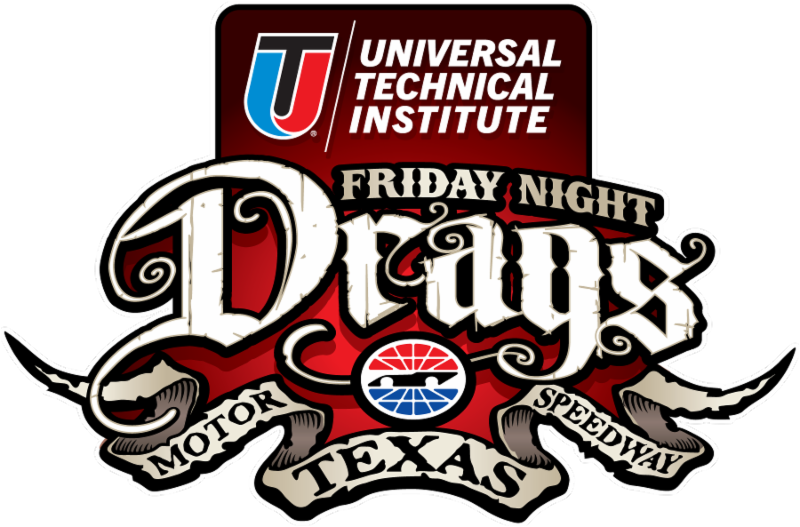 For more information and official rules regarding the Universal Technical Institute Friday Night Drags, visit http://www.texasmotorspeedway.com.